Perth’s choral music renaissance is about to get a boost. Seesaw editor Rosalind Appleby talks to Luke Donohoe as Fremantle gets ready to host a four day festival of choral music. 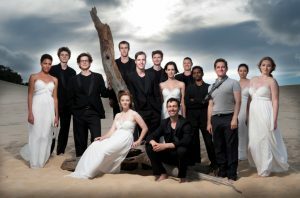 For several years Perth has been experiencing a renaissance in choral music, with new, agile ensembles like Voyces, Baden Street Singers and ensembles from St George’s College building on the work of established groups like St George’s Cathedral Consort, Perth Undergraduate Choral Society and the Giovanni Consort. Appreciative audiences have been enjoying vibrant and creative performances of an increasingly broad range of choral repertoire. The interest in choral music has also found its way into the education program with expanding choral programs in schools like John Septimus Roe Anglican Community College and Aquinas College. Next week Western Australia’s growing appetite for singing will be indulged with four days and over 80 performances by local, national and international ensembles at Choralfest, the Australian National Choral Association’s biennial celebration of choral music. The festival will be held in Fremantle and kicks off on April 13 in true Aussie style with a pub choir at Clancy’s Fish Pub. It includes workshops, concerts, keynote presentations and free events including a Palm Sunday Procession through the streets of Fremantle. The Australian Voices (Queensland) will feature at the Choralfest Gala Concert on April 13. It is the first time the festival has been held in WA in 25 years. Choralfest manager Luke Donohoe says organisers wanted the festival to be as broad as possible. This year the festival will include a unique feature on Noongar song with presentations by ethnomusicologist Clint Bracknell and Roma Winmar, sessions on teaching traditional songs and a choral presentation involving indigenous dance. The English tradition of choral singing will be also be showcased with keynote speaker Robert Hollingworth bringing his experience as director of the Britain’s I Fagiolini ensemble. Sessions on youth choral music will be presented by keynote speakers Mark O’Leary (Gondwana Voices) and Jennifer Tham (Singapore Youth Choir). Forty-five choirs will participate, from as far afield as Botswana, New Zealand and Singapore, presenting a breathtaking range of repertoire from sacred choral music to barbershop. “We believe choral music can and should be for everyone. It may have a reputation for ruffled collars and cassocks but it is also about pub choirs that are going to sing Chumbawamba’s Tubthumping,” says Donohoe, who is also president of Voyces choir who will be performing at the festival. Organisers are expecting more than 300 local and interstate delegates and over a thousand participants by the end of the festival. The flexible registration means music lovers can register for just a concert or a day, and choose to participate in choirs that match their age or taste. Choralfest also offers local choirs and audiences a vital link to choral developments nationally and internationally. Choralfest runs April 13-16. Registration and concert details can be found on the website.